Targeting your company’s specific and unique needs can be a major undertaking and a significant investment of time and resources for any organization. Consensus on subject matter, and converting that material into useful course material requires navigating through many steps to reach the final product. 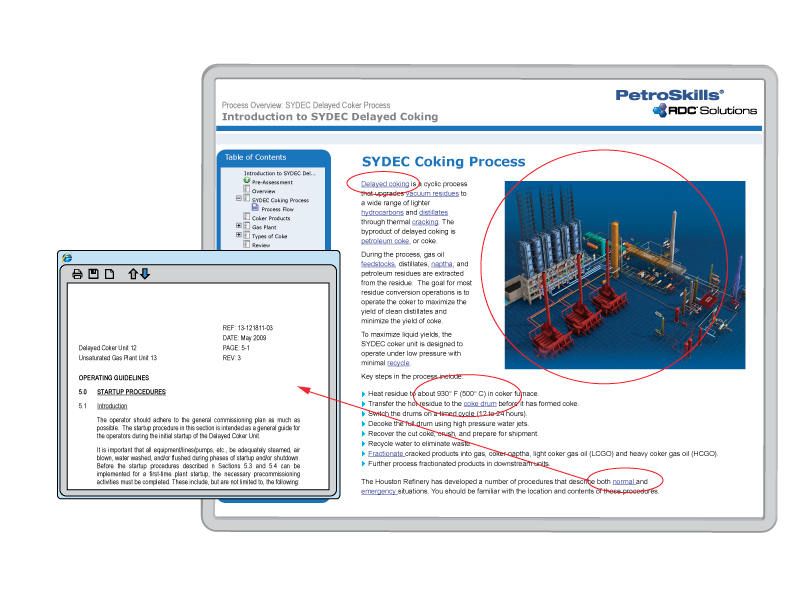 Fortunately, PetroSkills | RDC Solutions can design and develop your custom content. Our solutions are driven by the challenges facing our clients in the oil & gas industry. And our deep and effective learning content is at the core of our solutions. For more than 50 years, the focus of RDC Solutions has been focused on knowledge transfer in the oil & gas industry. Our solutions are used globally by over 1.4 million learners in over 500 facilities, spanning six continents. We have created over 750 hours of mandated, core competency and unit operations content. Our learning content and methodology have been certified for excellence and quality by industry accrediting organizations and as such, successful completion of our learning modules allows learners to earn Continuing Education Units (CEUs). We work with your subject matter experts (SMEs) to identify and capture the knowledge requirements specific to your environment, equipment, and units, but your SME time committment is minimized because of our knowledge capture methodology. Once we’ve developed and validated the Knowledge Requirements Analysis, your SME reviews, provides feedback, and approves the work we’ve done. Next the approved content is validated by a sample learner population for knowledge transfer effectiveness. And the content is validated to the standards of Instructional System Design. Web technology allows self-paced programmed learning that motivates adults to control their own learning and accommodates learner differences. Learners can easily bookmark their place and return to the program if other issues demand their attention. Delivery via web technology enhances many of the principles of instructional system design and puts online learning at an advantage. Intuitive navigation through sequenced steps with immediate feedback, as well as automatic remediation enable learner engagement. Additionally, detailed animations and graphics can be included, and embedded glossaries and bookmarking add convenient functions. Language translation is also easily facilitated. The nature of the technology allows for site-specific customization by embedding procedures, terminology, graphics, equipment ID numbers, exposure limits, operating parameters and more.